Sony, Valve and Oculus are putting their faith in Virtual Reality as the future of video games – and they could be right. On the other side of the fence though, we have Microsoft and Magic Leap, who’re embracing augmented reality; things overlaid on top of the things we see in real life. Microsoft has its Hololens, which as a tech demo, is ludicrously impressive stuff – whether or not it’ll work that way in reality is a very different question. 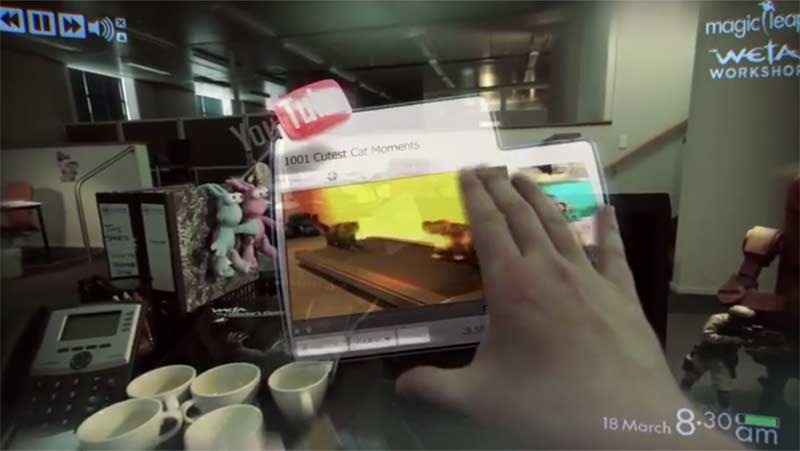 Augmented reality startup Magic Leap, which managed to raise over half a billion Dollars last year (much of it thanks to Google) has released a video showing what their tech is capable of – or at least, a digital approximation of what their tech is capable of. A video released by the company gives us a first real glimpse at what they’re up to, showing how users can interact with apps and desktop icons and manipulate things in real time, in 3D. Later on in the video, we get to see how it might be used for video games, showing how real(ish!) weapons can be used to take on virtual enemies. The first-person video goes on to show how the technology can be used to create an immersive shooter game that uses physical weapons to fight virtual robot enemies. “Unfortunately, we couldn’t make it to TED, but we wanted to share one of the things that we’d planned to share at the talk,” the YouTube video’s caption says. Magic Leap, a company that’s been purposefully enigmatic, still hasn’t said what they’re really doing, offering little more than this video. I don’t quite buy it as real just yet, especially as special effects company WETA – the folks behind the special effects in Lord of the Rings – had a hand in making this video. “We know what you’re thinking: ‘Who the heck are we? What is this all about? Why aren’t you saying anymore?’ And you’re right, we need to say a little more about what it is we’re creating.